Five generations later, hitters discovered that being big and strong was better than otherwise. How far that idea went is a topic for another day, but from the 1970s to the 2010s, the weakest players were culled from the herd. This shows up in the statistics, but just to give you one example, here are the numbers for two starters at the same position for the same team 40 years apart. Go ahead and guess, I’ll wait. These two seasons were worth basically the same, with offensive WAR figures of 0.6 and 0.8, respectively. The player who came along 40 years later couldn’t hit for average or get on base, but being 30 pounds heavier, 30 pounds stronger, he was able to extract more value from those times when he squared the ball up. Freddy Galvis hit more homers last year than Larry Bowa hit in his 16-year career, and therein is the evolution for hitters. The league was lousy with Bowa types in the 1960s and 1970s, shortstops and second basemen and center fielders who had no power at all. There were 102 players who had 300 PAs and fewer than five homers in 1976. Last year, there were 31. There were 86 players listed at 175 pounds or less who had 300 PA in ’76. Last year, there were 12. The average time of game in 1976 was 2:29. The average time of game in 2016 was 3:04. You think it’s all because of batting gloves? The 1976 season was also the last one in which baseball games averaged fewer than 2:30 — a figure which, for a lot of people, is the optimal length of a game. Now, I can get on board with that idea, but here’s what you’ll need to do to get back there: cap player height, cap player weight, cap pitch velocities. The game of 1976 wasn’t faster because Baby Boomers were highly motivated; it was faster because pitchers didn’t have to worry about any given pitch getting hit over the fence. Their job was, put simply, easier. If you took Jerry Reuss and had him pitch 1970s-style to the let’s-all-point-and-laugh 2017 Padres, the top of the first might never end. What we’ve had since 1976 is an arms race. Batters have kept getting stronger, and players with strength have crowded out players who lack it — not only at traditional hitting positions, but at all of them. At the same time, pitchers have, with the aid of team management around the league, traded endurance for velocity. In 1976, 24 pitchers threw 250 innings and 61 threw 200 innings. The average relief appearance lasted 1.7 innings. Last year, they’d have arrested any manager who let a pitcher throw 250 innings, and just 15 — one on every other team — threw 200. The average relief appearance lasted 1.04 innings — 60% less work. If you sent Noah Syndergaard back to 1976, they would burn him as a witch, but not before getting 280 innings out of him. Baseball in 1976 was a bunch of guys throwing 86 and dialing it up to 91 now and again, pitching to a league where half the hitters couldn’t reach the warning track with two helpings at breakfast and an aluminum bat. Baseball in 2016 is beasts averaging 93 and then leaving after a couple of hours so beasts throwing 97 can go to work, taking on a league where everyone can turn around a fastball. Why, I mean, in the world, would we expect these two things to take anywhere close to the same amount of time? They are barely, just barely, the same sport. If you want baseball players in 2016 to play 2:30 games, then stop after seven innings. You’ve probably seen the Grant Brisbee bit about why games are so long. He concludes, “Time between pitches is the primary villain.” He’s right, but it’s not because of sloth; it’s because baseball is a lot harder now. Baseball is harder now because the batters are bigger and stronger and the pitchers throw a lot harder, and they have things like cut fastballs. No one in that 1984 game had ever seen a 94-mph cut fastball. The presence of Dwight Gooden notwithstanding, no one had seen a 93-mph slider or a 90-mph changeup, praise Thor. Edinson Volquez was in that Brisbee piece, and no one thinks he’s any good, and he throws 93. It takes an extra tick or two to gear up to throw that kind of stuff, and it takes an extra tick or two to gear up to hit that kind of stuff. Velocity and strength, over time, have stretched the natural length of a baseball game. These factors, more than anything else, are why baseball games now take about three hours. This brings us back to game play. The velocity and strength slowing down the game are the same ones taking action out of the game. From 1871 through today, baseball has steadily moved from a ball-in-play game to a pitcher/batter game. Those trends have accelerated of late. Back in Larry Bowa’s day, 78% of PAs ended with a ball put in play. That figure was 68% last year, the lowest in baseball history. 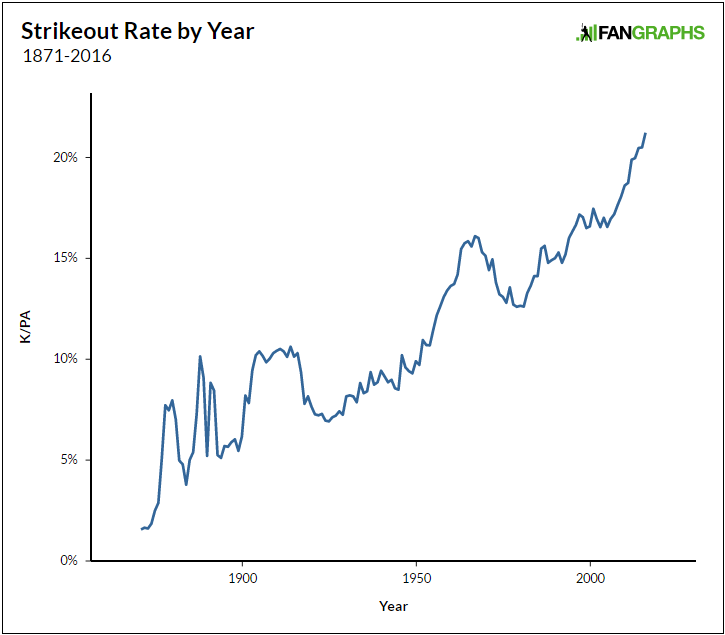 (It was 91% in 1883, the last year before they let pitchers throw overhand.) Velocity and strength are pushing the ball out of play more and more, slowing down the game more and more, until it looks almost nothing like its origins. You can’t fix the pace-of-play problem apart from the game-play problem. They’re the same problem, and they require not just solutions that go beyond anything that’s been discussed, they require thinking beyond what we’ve ever seen from baseball. Any major change in baseball across its history has been reactive: move back the mound, mix in more clean baseballs, lower the mound, add a designated hitter, expand the playoffs, drug test everyone. At no point has anyone ever convened, or had to convene, a conversation about what baseball should actually look like. The pace-of-play/length-of-game discussions are people arguing 2:30 is the right number, even though 2:30 for a baseball game would have sounded crazy to their fathers, who grew up with two-hour games in the 1940s. Maybe 2:30 is the right number. Maybe it’s 2:45. Maybe it’s 3:30 with an intermission, and only on Sundays in the fall. Rob Manfred — and, in fact, all of us — have largely been talking about the downstream effects of strength and velocity on baseball games. That’s not where the solutions are. The solutions are in figuring out how to either limit strength and velocity, or in changing the game to accommodate them while sustaining an entertaining product. They’re not in intentional walks, or shifts, or commercial breaks, or pitching changes. They’re in strength and velocity. The first step is identifying the problem. I don’t have an answer. I’m just trying to change the question to this: how do we put more baseball back in the baseball game, when all of the baseball players are being selected for the things that take baseball out of the baseball game? We hoped you liked reading The Pace-of-Play Problem Began in 1884 by Joe Sheehan! Obvious ideas are bump the mound back a few inches and push fences back. But what other results come about if you do either of those? Move the pitching rubber to the centre of the infield. I mean – why isn’t it there already? Think of the symmetry! Higher mound is likely to mean more strikeouts. Both your suggestions just limit offense, when thats not the ultimate goal. Thicker bat handles may help curb hitters from swinging for the fences. I have no idea how to stop pitchers from throwing 97, or convincing teams not to load up an 97 mph guys in the bullpen and asking for no more than six, when all the evidence points to fresher pitchers doing better. I used to watch baseball every day. Now I can’t stand 4 hours, 9 innings games. It’s unbearable. Sheehan ignores all the crutch grabbing and glove adjusting the batters do between pitches. The pitchers take too long to pitch too. Accustom minor league pitchers and batters to a 15 second pitch clock and start with a 20 second pitch clock in the majors that decreases to 15 in a decade so veteran players get used to it. If Mark Buerhle could make pitches each 15 seconds, then it’s a matter of all the pitchers making it an habit. Moving the mound back, besides giving the benefit of more balls in play, would also prevent a pitcher from potentially dying in the field with a +110mph off the bat ball in play striking his head, which would be a PR catastrophe for baseball. Thicker bats would probably work – increase contact % but reduce bat speed. Yup. Then add a couple extra fielders to patrol the bigger playing area. These extra fielders are likely to be worse hitters with less power since all the bets hitters are already playing every day. This cuts down on TTO by bringing those guys to the plate less often. Or maybe they just start developing more and more hitters who are TTO types and it makes no difference at all. Don’t add fielders, that just encourages people to swing for the even more distant or higher fences and to go for strength over skill. Make the field big so teams have to get speedy outfielders who can cover lots of ground or watch balls fall in for hits. Two-thirds of the Earth is covered by water. Back in ’76 The other third was covered by Garry Maddox. Make Hamilton an ideal center-fielder rather than a weird outlier. 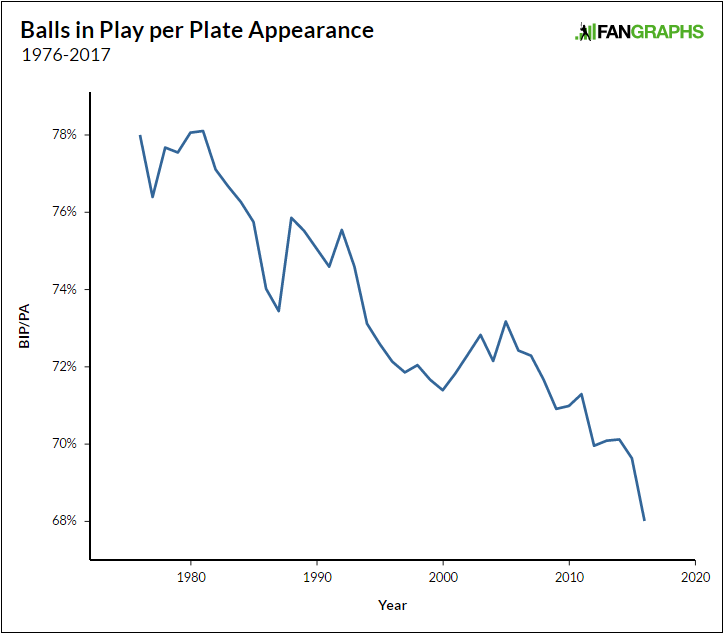 In addition to fences creeping in, the trend towards ever-shrinking amounts of foul territory makes range-limited outfielders and corner infielders more viable. What does moving the fences back help? Do people really want to see fewer homeruns? Personally, I don’t. But if the goal is to maximize balls in play and create more “excitement” that would be an answer. I don’t care too much either that games are longer than they have been. Sure it’s a headache at times, especially the playoffs when I want to sleep and games run way late, but I do’nt notice how long it takes while I’m watching it because I’m so invested. I only notice the next day when I feel like crap and realize it’s because I went to sleep at 2 in the morning.